Should food and cooking be considered as an artform? I believe it should! Just take a look at the colours in this meal and agree with me! Just look at the colour of those figs and onions. What painter could invent this? But most important they compliment the “Cherry beer braised chicken” I made last week. This delicious stew had been on my mind for a while. I finally managed to bring it on the BBQ and serve it to you. As told above, the idea for this recipe was formed a while ago. In the end of september my mother gave me a royal part of her homegrown figs. She suggested to braise them in some port. She made a similar meal before and I have to admit it tasted delicious. Especially for those in love of sweetness. Last weeks “Trolls Wings” were I told about the cherry beer brine my friend uses for his wings made me think about the recipe again. I decided to finally use those figs and use them in a cherry beer braised chicken stew. Though the suggestion made by my mother was a good suggestion I decided to go for something different. Mom I promise you: “Next part of the stash will drink some port”. I opted for the beer for a more balanced palate. Lindemans Kriek is a belgian Lambic style beer. The “Geuzesteker” combines “old aged cherry beer” with a splash of young cherry beer. This way there’s a secundary fermentation in the bottle leading to a nice sparkling beer rich in flavor. In opposition to moste Geuze beers the taste is sweeter. The usage of unsweetened syrup instead of fresh cherries makes it less sour and more approachable. This type of beer compliments the fruit in the stew but also adds an extra layer of subtle bitterness and a gentle sour flavor. Since the beer was sweeter than I thought it would be I added some extra lemon peel and raspberry vinegar to further enhance the acidic taste. You can do this at your own taste. If you think it tastes to bitter in the end you can always add some extra sweetness to bring more balance. I let the ingredients simmer gently for about 1h30 in the fireproof bottom part of my fireproof Tajine. Since it allowes me to cook the stew directly above the fire and has more place than my skillet I consider it as an excellent option. 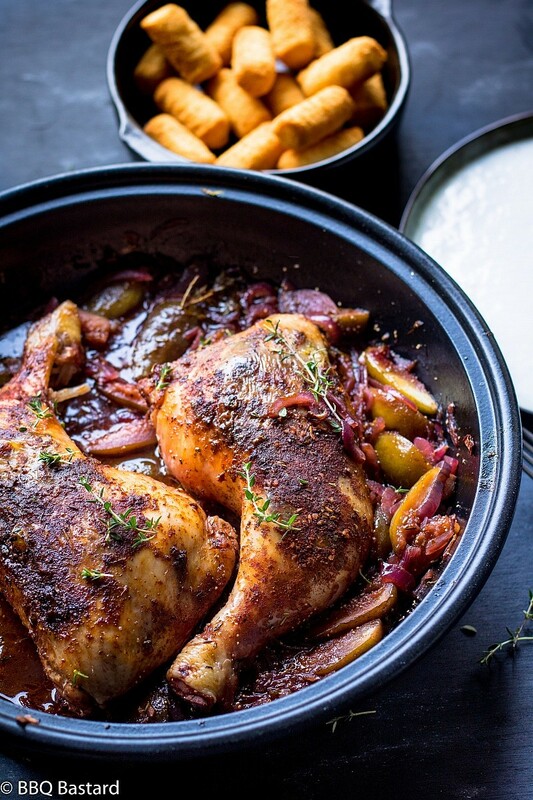 You could also use the tajine on it’s own for this chery beer braised chicken stew. Before adding the chicken thighs to the stew I rubbed them with a mixture of “Ras el Hanout”, smoked Paprika and salt. I grilled them on a high fire to roast it on the outside and let it simmer afterwards. “Ras el Hanout” is a Morrocan spice blend with the best spices a shop owner sells. Storebought Ras el Hanout is a commersialised spice blend. Each brand uses it’s own different spices and proportions making things somewhat complicated. I used this one by “Jonnie Boer” consisting out of Paprika, coriander seed, cumin seed, ginger, cinnamon, black pepper, turmeric, nutmeg, cloves, piment and cardamon. 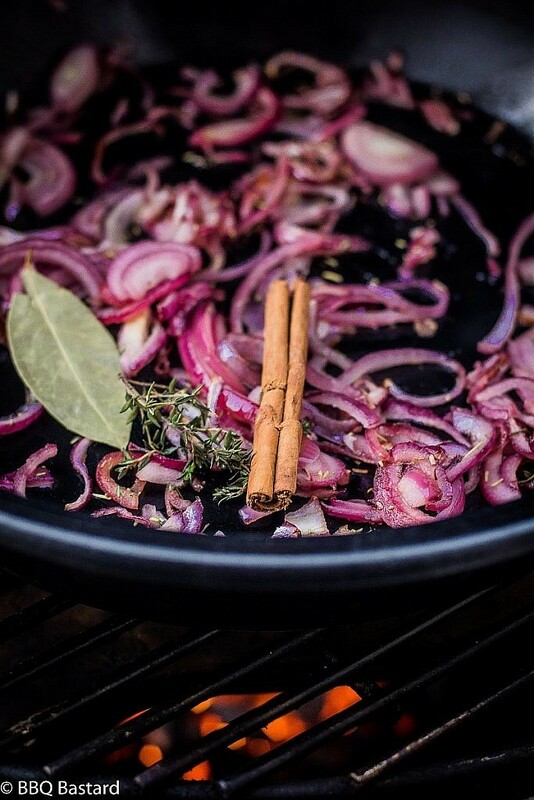 Spices that compliment the meal served. Don’t forget to rub under the skin! My wife always laughs when I’m proudly saying it tastes delicious. In our environment it appears the men like to themselves on the shoulder (hope this is an english saying too :p) when we have made something good. Women keep waiting to hear it from another. Anyway: I’m glad I finally made it to present this recipe. For lovers of beer this is a recipe you need to try once. I would be glad to see your result and hear what you made of it. Moreover: If you made some delicious BBQ meals yourself I would love to see them appear on the facebook page too! I would share your passion for cooking with love! Feel free to do the same. 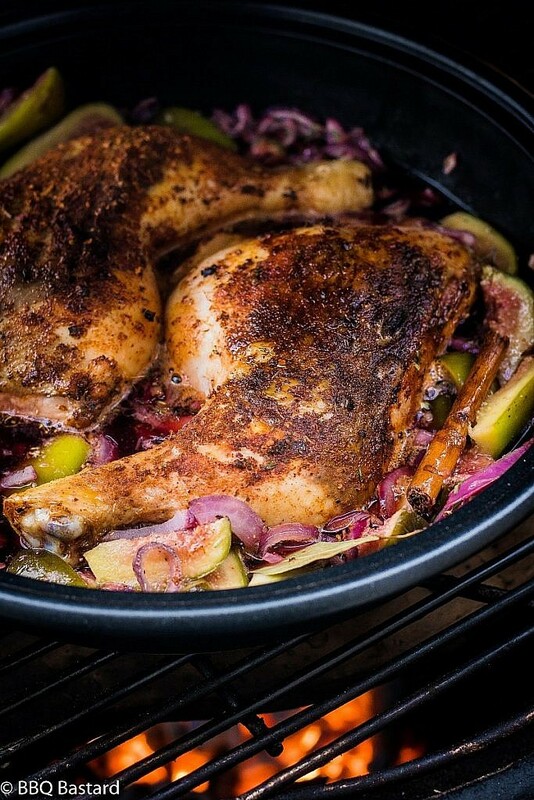 Feel free to share the cherry beer braised chicken with your friends. Even if they don’t know how to handel a BBQ. They could use the oven to make this recipe and hopefully they will realise one day the BBQ could add some extra depth to their meals. The more people enjoying BBQ the better the world will get ? 1. Mix 2 Tbsp. 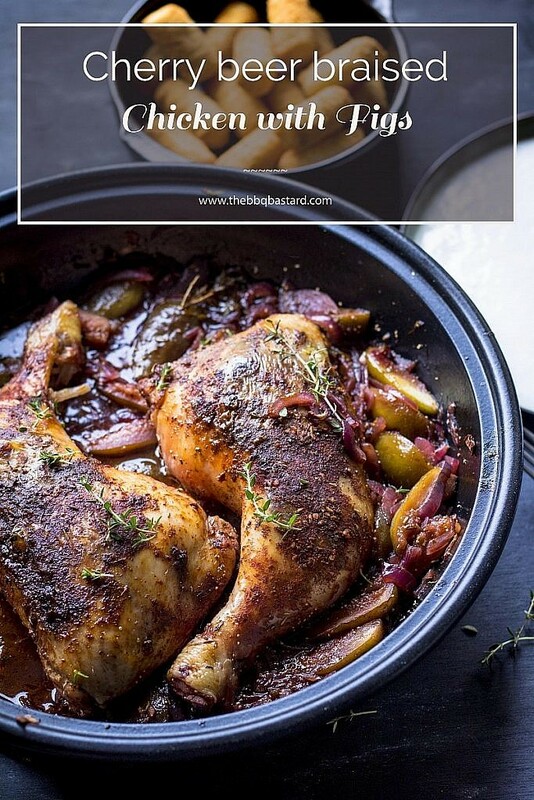 Ras el Hanout with 1 Tbsp. smoked paprika powder and 1 Tbsp. salt. 2. Rub the chicken thighs with the mixture and put aside for an hour. 4. 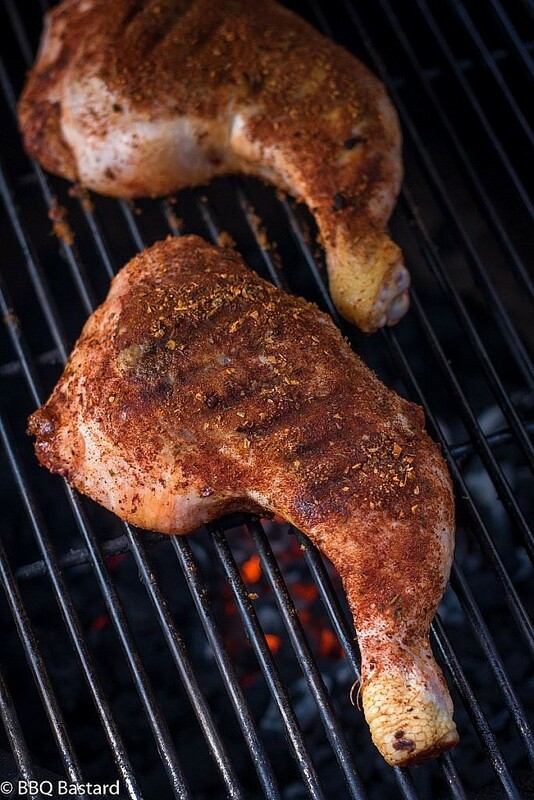 Grill the chicken thighs until they are golden brown. Put aside. 5. Put a large deep skillet or fireproof deep pan on the grill. Add 1 Tbsp. coconut oil, 1 Tbsp. fish sauce, 1 Tbsp. agave syrup (or honey), 1 Tbsp. raspberry vinegar, thinly sliced lemon rind, 1 bay leaf, 3 twigs of thyme, 1 twig of rosemary and the cinamon stick. Let them cook for about 3 minutes. This will help the flavors develop. .
6. Slice the onions and add them to the skillet. 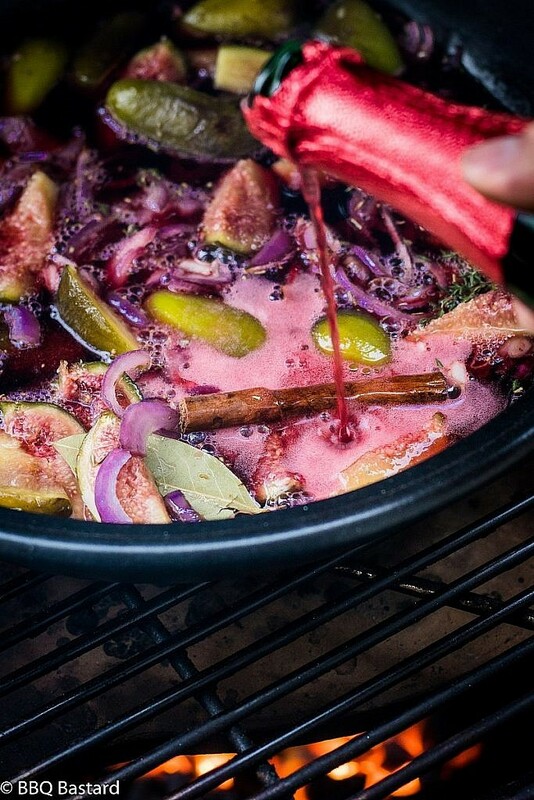 Let them simmer for 10 minutes before adding the quartered figs. 7. Let simmer for another ten minutes before pouring in the Lindemans Kriek beer. Stir and put the grilled thighs on top. 8. Cook for about 20 minutes (until the chicken is done). 9. Remove the chicken if your sauce needs to be thickened and let it rest for about ten minutes. Increase the heat of your grill to let the sauce cook for a while. Taste the sauce. Add some salt and pepper at taste, Some cane sugar at taste if it's a bit too bitter and some extra vinegar if needed. 10. Put back the chicken thighs and serve with croquettes, I also served some poached apples with cranberry sauce along. Drink a fresh Lindemans Kriek with it and your settled for a delicious meal. - The Lindemans Kriek was used without any commercial intent. I bought the beer myself and don't get money for promoting the product.